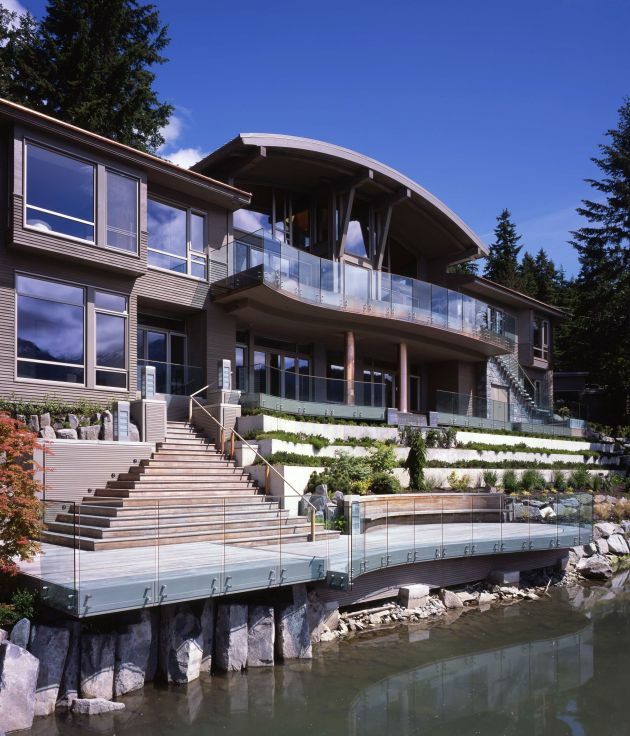 Vancouver, Canada based architect Fook Weng Chan has designed the Lakeside Residence. 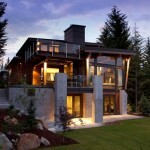 This crafted contemporary home is located in ski-country close to Vancouver. The lot offered views across a glacial-fed lake to three mountain peaks. However it is also located adjacent to a highway. 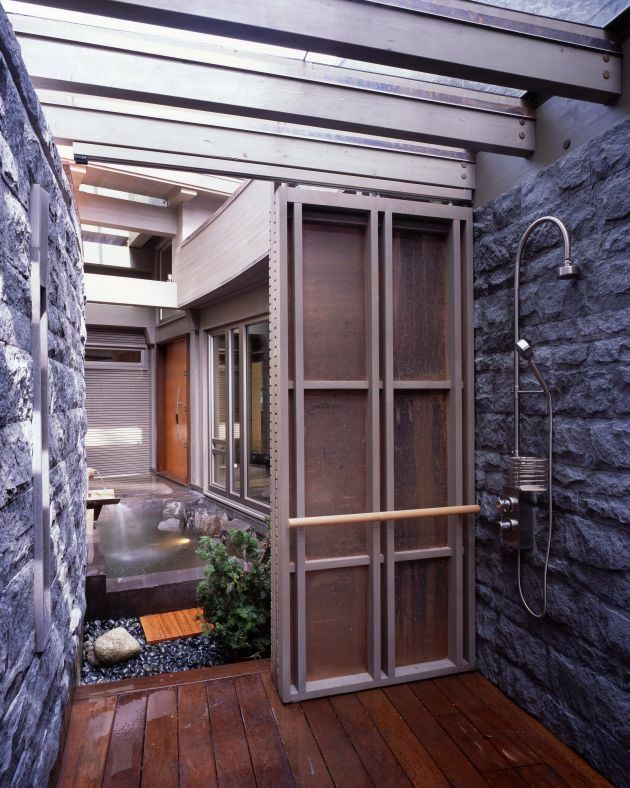 A design was developed to take one through multiple ‘layers’ of house – from driving highway speeds, slowing one’s psyche down as one wanders through a meandering path within a compact forested frontyard; entering a translucent glass & fir gate in a curved stone wall which serves as a buffer between highway & house; into a ’zen-like’ compact entry courtyard, with a pool & water feature. All along the way, one pauses to become enveloped with a sense of tranquility. One then enters the house. 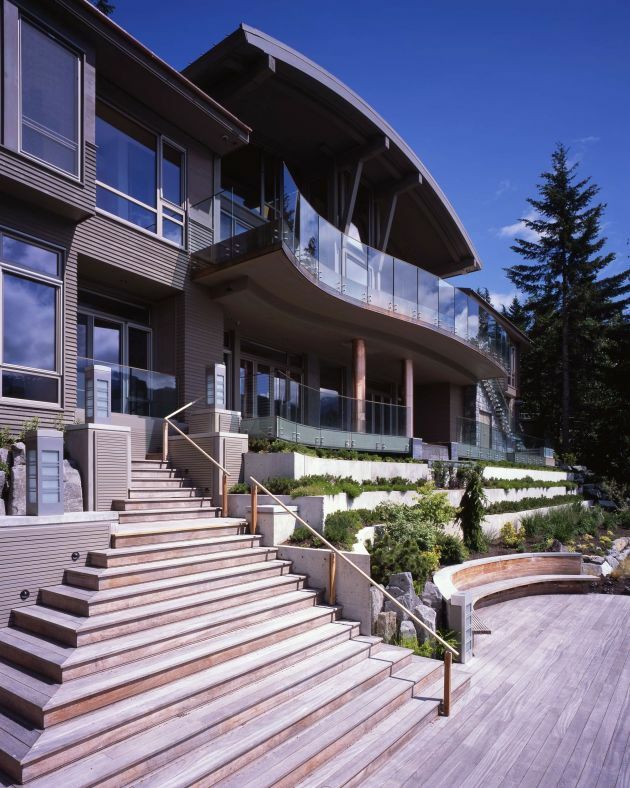 A timber colonnade frames the lake & mountain view directly ahead. 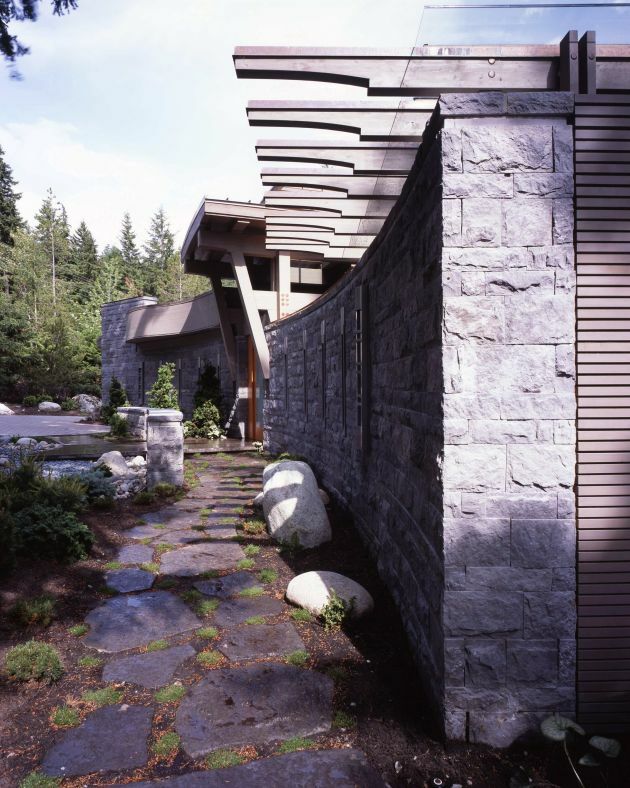 Another timber colonnade perpendicular to the first serves as a circulation spine and organizing element for the house. The posts suggest enclosure for each space in the otherwise open great room. Other rooms are like alcoves off this main space. 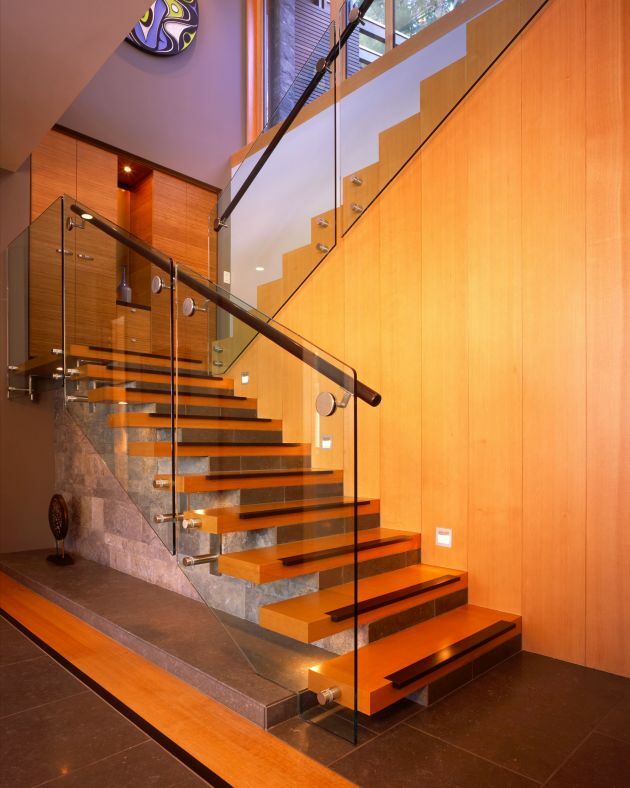 One moves through the great room to the balcony, which has an exuberant cantilevered curved edge, suggestive to the joy of carving into the snow when skiing. 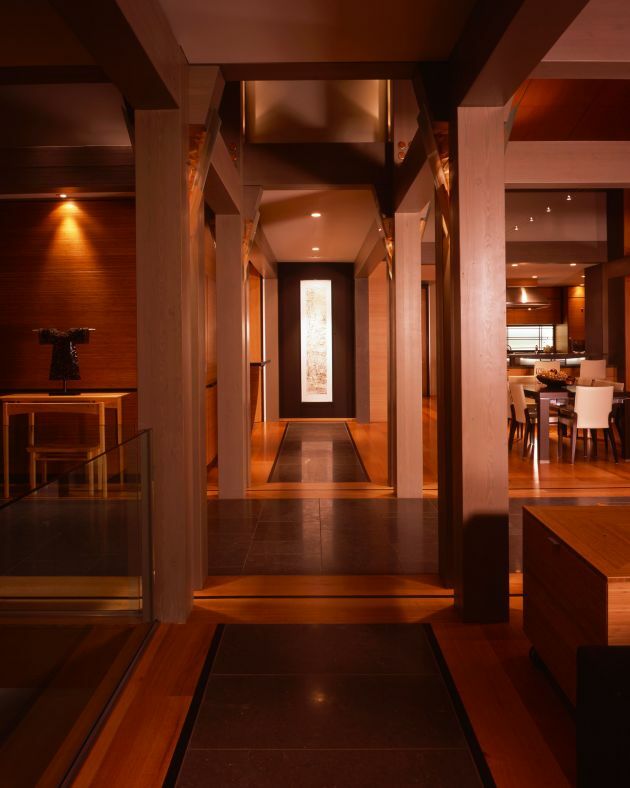 Local basalt is used for the stone clad walls; local Douglas fir for the timber structure and ceiling panels in the great room. 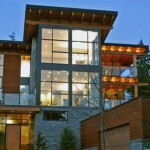 Exterior walls are also of local Western Red Cedar and copper. Cabinetwork is predominantly of bamboo. The building is heated and cooled using geo-exchange off the lake source. 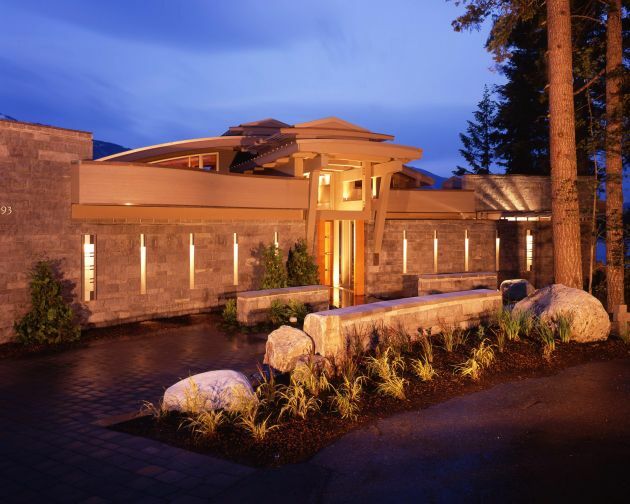 The house presents a low-key, substantial stone walled front and a more open lantern-like private lakeside, resting on a landscaped terraced concrete podium. It is a of a moderne expression, but, upon closer scrutiny, rich with subtle displays of craftmanship – the expression of the human hand and spirit. Visit the Fook Weng Chan website – here.